This is our custom-built Carol Brand RG-6 Clock/SDI/SPDIF/Video 75ohm coaxial cable. 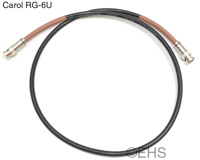 Construction is RG6/U coaxial cable with your selection of connectors. Connectors are all compression fit connectors which are tight fitting solid connectors with a corrosive resistant nickel finish. Our RG6/U cable is a coaxial style cable that is moderately flexible, fairly durable, light-weight cable, with 18awg center and 100% coverage dual layer shield. By specification SPDIF, Component (RGB and Y/Pb/Pr), Composite video and Clock all have the same wire requirement of 75ohm coaxial cable, so this fits the needs for digital audio, video and Clock. Typically SPDIF uses RCAs, Clock uses BNCs, and Video uses both BNCs and RCAs. There are many factors affecting digital and video performance, for example noise in the environment, bit rate or data rate, and cable characteristics. As a good rule of thumb it is good to keep SPDIF runs to 10ft to 15ft maximum, and video runs under 25ft, and as always the shorter the run the better. What it's connecting to or from, for example "CD out", "Channel 1 In" etc. Photo 1 shows 3' cable with brown shrink color label and BNC connectors. Photo 2 shows the two ends with brown shrink color label and BNC connectors.